Researchers from Rice University have demonstrated a nanoscale sandwich, which they hope will become a molecular deli for materials scientists. The sandwich has two slices of atom-thick graphene around nanoclusters of magnesium oxide that provide the extremely-strong, conductive material with expanded optoelectronic properties. Rice materials scientist Rouzbeh Shahsavari and his colleagues constructed computer simulations of the compound and discovered it would offer features ideal for sensitive catalysis, molecular sensing, and bio-imaging. Their research could enable scientists design a variety of modifiable hybrids of 2D and 3D structures with encapsulated molecules, Shahsavari explained. The research has been published in the Royal Society of Chemistry journal Nanoscale. The researchers were inspired by experiments in other places where a variety of molecules were encapsulated using van der Waals forces to bring components together. 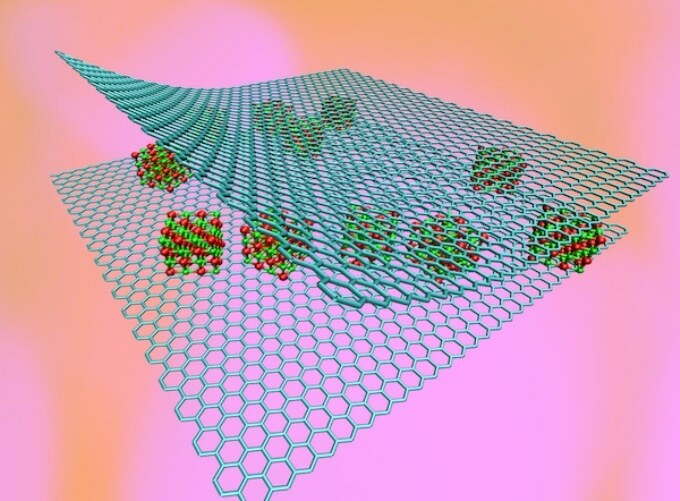 The Rice-led research was the first to use a theoretical approach to defining the optical and electronic properties of one of those “made” samples, 2D magnesium oxide in bilayer graphene, Shahsavari said. We knew if there was an experiment already performed, we would have a great reference point that would make it easier to verify our computations, thus allowing more reliable expansion of our computational results to identify performance trends beyond the reach of experiments. Graphene by itself does not have any band gap – the attribute that makes a material a semiconductor. However, the hybrid material does possess a band gap. This band gap could be tunable, based on the components, Shahsavari said. The improved optical properties are also useful and tunable, he added. “We saw that while this single flake of magnesium oxide absorbed one kind of light emission, when it was trapped between two layers of graphene, it absorbed a wide spectrum. That could be an important mechanism for sensors,” he said. Shahsavari said his group’s theory should be appropriate for other 2D materials, like molecular fillings, and hexagonal boron-nitride. There is no single material that can solve all the technical problems of the world. It always comes down to making hybrid materials to synergize the best features of multiple components to do a specific job. My group is working on these hybrid materials by tweaking their components and structures to meet new challenges. Farzaneh Shayeganfar, a visiting research scientist at Rice and researcher at Shahid Rajaee Teacher Training University, Tehran, Iran, is the paper’s lead author. Co-authors are Javad Beheshtiyan and Mehdi Neek-Amal, both of Shahid Rajaee and the University of Antwerp, Belgium. The research was supported by Rice University and the Iran Science Elites Federation. Computing resources were provided by Rice’s National Science Foundation-supported DAVinCI supercomputer administered by Rice’s Center for Research Computing and were procured in partnership with Rice’s Ken Kennedy Institute for Information Technology.